Me: Good fart! Who makes the best farts? If someone had told me that I’d be having these kind of exchanges with my baby before I had one, I wouldn’t have believed them. 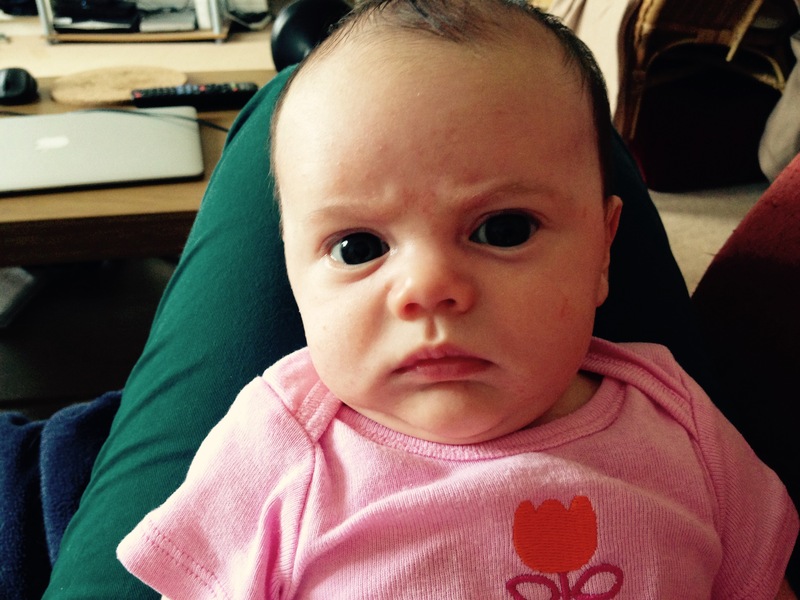 I wasn’t going to be one of those parents who conversed with their wee one using baby talk. I was going to talk to her using proper words spoken in a normal adult voice. I would tell about literature and art and music and she’d be the smartest baby around. Instead, I open my mouth and complete nonsense comes tumbling out. “Gaa and goo and goo and gee!” I say to her, poking her in the belly to try to make her smile. Most of the time she looks back at me with her “I’m totally judging you right now” face. But sometimes – when I’m lucky – I get one of these. And it’s the best thing ever. Love the Popple … Love you! You make me smile and cry all at the same time! Moms talk and talk and talk. Babies respond with their own language…and sounds! Do everything you can to play with words and sounds and tunes and she will love literature, art, music, and every other wonderful thing in this world. So happy to see you so happy with this lovely baby girl.